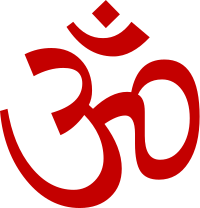 Aum (“ohm”) symbol, from Wikimedia Commons. One of the things we discussed, and practiced, in my very first Teacher Training class two evenings ago was “AUM.” I’d seen it spelled like that in the course outline and my first thought that it was some acronym having to do with physiology or orthopedics. Somewhat humorously, it was my mildly yoga-averse husband who spotted it over my shoulder and read it aloud, and got me on the right track. In my several years of yoga, I’ve had many opportunities to sing, and chant, this AUM. Although the teacher sometimes explains its meaning to the class, for the most part, it’s mainly been a fun, rare opportunity for me to sing, and to hear my singing voice in the company of many others singing the exact same thing. Along the spectrum of all things yoga that are weird to westerners, it’s on the easy end: It’s fun, and it’s physical. (As my husband will attest, I’ve rarely bothered myself with understanding some of the words I hear or repeat in song, anyway.) I always enjoy it, though more so when I’m with other people, and more so when my pitch isn’t horrible, in relation to the other voices in the room. What was confirmed, for me, at that class: AUM can be one of the optional cues that your yoga asana practice session is starting or beginning. And in many yoga classes, the teacher will guide the students into setting a dedication or “an intention” for the class. Very often this means selecting someone in your life that you feel needs extra love and strength. This dedication, at its simplest and least committal, is just an opportunity, at the start of a class, to think about the people I know and if any of them are having a tough time of it, on that day. This dedication, if I’m feeling a little less scattered at that time of day, may also give me the opportunity to send healing thoughts in their direction. As hippy dippy as that sounds, I feel it’s the essence of prayer, and a lot of not-so-hippy dippy people really believe in the power of prayer. In my life so far, I don’t have any proof that any such vibes that I “send” do anyone any good, but I continue to hope. My mom the lifelong nurse does believe in the power of prayer; she’s seen a lot of pain and a lot of healing in her life. So, I continue to think about my friends, family, and even strangers, at the start of many yoga sessions. Back to the AUM: So, the vocalizing of it is one way to formalize that dedication. It’s putting a stamp on it, and sending it off on its way, so that you can focus on your practice, and not continue to stress about about the person who needs your help. It’s forcing you to NOT multi-task. It provides a way to feel good about being so selfish as to take a whole hour to focus on your body. This sounds shallow, but it isn’t, necessarily. What I learned, in the context of this yoga discipline: the AUM spelling is a more phonetic and more symbolic way to describe what the sound means: it’s the sound the universe makes, or the original vibration of the universe’s creation. It can be broken down into 4 parts, that can be explained on several levels. Phonetically: the A, U, M, and a silence at the end. Resonance-wise: lower abdominals, heart/solar plexus, skull, and… silence, again. Symbolically, on one level: waking, dreaming, deep sleep, and bliss. On another symbolic level: beginning, preservation, end/destruction, and nothingness. The symbolism takes a turn into mild cultural murkiness for me, but it’s a small taste that isn’t too alienating. One more layer separates AUM into Brahma, Vishnu, Shiva, and Samadhi. I would love to learn more about them and their relationship to the fabulous, elephantine Ganesha (who wouldn’t love a bejeweled elephant who is known as the destroyer of evils and obstacles? ), but that can wait, for the moment. On the topic of alienation: I am really digging the approach to yoga that this particular school takes. It’s very inclusive, respectful, and insightful for the average American. One fellow student in class on Wednesday asked why classes at that studio don’t often call upon students to do AUM, and the response to her answer was that it can intimidate people. Alienation (the word I first chose, above), is making someone feel different, like an outsider, while intimidation is frightening someone; making her feel small or inconsequential. I’ve experienced instances where both words can apply, in various classes over the years. I’ve certainly felt a little of both, myself. The AUM has never had that particular effect on me; as a matter of fact, its simplicity, and the situation’s similarity to a grade-school class room (everyone is sitting on the floor, cross-legged, and singing) is very inclusive, for me. Plus, there’s no way to forget the lyrics! And, as someone who didn’t get to experience the sixties, and someone who love love LOVES California, I get a kick out of getting to do this one mostly innocuous thing that history and movies tell me was counter-culture. There have been, mostly in the Iyengar style yoga that I practiced for many years, a variety of mantras or prayers in a foreign language that have been intimidating and alienating for me. The invocation to Patanjali was one of them, and its fright factor was partly due to its length. So, first off, I had the feeling that I was being a bad student, if I hadn’t memorized it yet. The teacher reassured us that it was ok to read the words, but it was difficult to overcome a feeling that you’ve disappointed the teacher or have been unable to do what your classmates have already achieved. I stuck with the latter for maybe a year. Having gained no better understanding, and having found more meaningful rituals, I stopped incorporating that prayer into my home and class practice. It will be enlightening, in the coming weeks, to look at the learning process from a teaching standpoint. I hope to gain a new understanding of alienation and intimidation, and the tools I can use to keep them at bay, as a student and teacher.